In a live broadcast today, NASA researchers announced the agency has uncovered the existence of key ingredients for life as we know it on Saturn’s icy moon, Enceladus. Scientists already knew that the moon had liquid water on the surface, due to the presence of geysers spewing water near the moon’s south pole. Now, hydrogen has been detected in those jets of water, which suggests the strong possibility that Enceladus’s oceans could support microbial life. 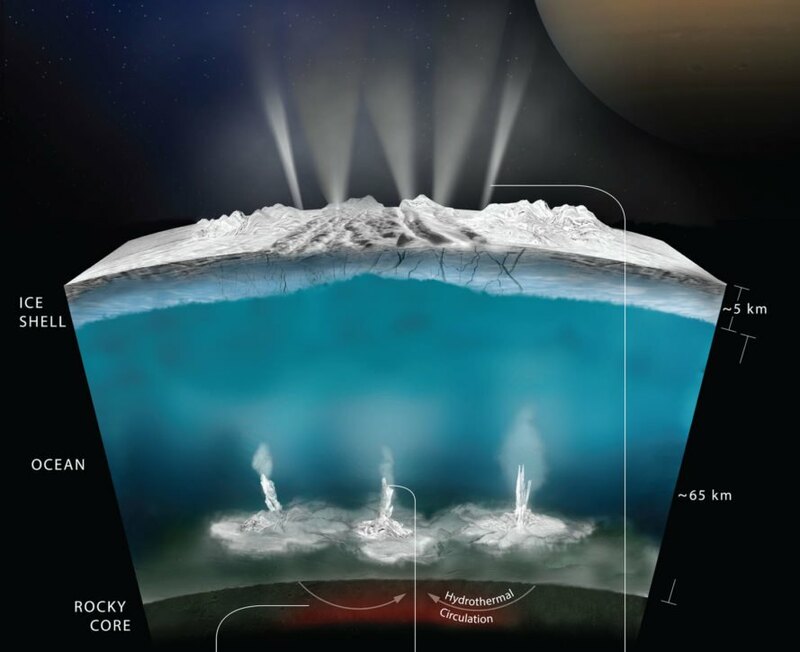 It may seem strange that an ice-covered world like Enceladus is being looked at as a potential source of extraterrestrial life, but beneath the planet’s icy shell spans a worldwide ocean over a rocky core. The ice is thought to act as a protective outer layer for the sea, the same way that our atmosphere protects Earth and makes life possible on our own planet. In fact, NASA is closely observing many of these “ocean worlds” for signs of life. While Enceladus’s geysers have been known to scientists since 2005, this is the first time the Cassini probe has been able to detect any traces of possible life within them. It’s believed that the plumes originate in a hydrothermal system within the moon’s core, estimated to be 2 1/2 times more powerful than the one that drives Yellowstone’s geysers and hot springs. Despite the icy outer shell, the gravitational pull of Saturn provides heat for the water in the moon’s interior, another encouraging sign for the development of life. This new information about the moon comes from October 2015, when the Cassini craft flew into the plumes themselves, a mere 30 miles above the moon’s surface. The probe was able to capture particles from the plume inside a piece of equipment called an Ion Neutral Mass Spectrometer, which can analyze the makeup of material encountered on its journey through space. The probe detected a number of interesting organic molecules, including molecular hydrogen, carbon dioxide, and methane. The level of hydrogen, in particular, was surprising to researchers. This volatile gas isn’t easily captured on small, icy worlds like Enceladus, so there must be some chemical process beneath the surface producing the molecules. It may be that hot water from the ocean is flowing into iron-rich cracks in the sea floor, causing a chemical reaction that is constantly replenishing the ocean’s supply of molecular hydrogen. This is the same process that happens in Earth’s own hydrothermal vents, which helps fuel the strange and diverse ecosystems of the deep oceans. Because we’re familiar with exactly how this process supports Earth life, there’s a strong possibility that life could thrive on Enceladus in the same way. Unfortunately, we don’t currently have the instruments necessary to detect life directly on these watery worlds – only to look for the chemical indications of an environment that could potentially support it. NASA also today announced that they had found evidence of similar water plumes on Jupiter’s moon Europa, though less is known about their makeup. Unlike the Saturn Cassini mission, scientists don’t currently have an up-close view of Europa. Instead, they had to rely on data from the Hubble Space Telescope, which has been monitoring the moon to try to learn more about the makeup of its oceans. We may not know for certain until the 2020s, when NASA’s Europa Clipper mission is scheduled to launch. In a live broadcast today, NASA researchers announced the agency had uncovered the existence of some of the key ingredients necessary for life as we know it on Saturn’s icy moon, Enceladus. Scientists already knew that the moon had liquid water on the surface, due to the presence of geysers spewing water near the moon’s south pole. Now, hydrogen has been detected in those jets of water, which suggests the strong possibility that Enceladus’s oceans could support microbial life.